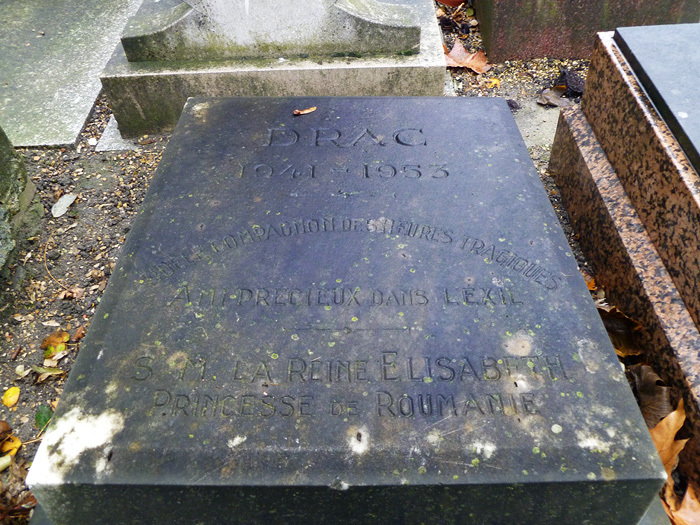 I was wandering around Le Cimetière des Chiens — the Dog Cemetery in Asnières-sur-Seine, just outside Paris, on a gloomy day a few weeks ago and noticed this tomb for Drac, a dog belonging to a Romanian Princess! A little research reveals that “Queen Elisabeth, Princess of Romania” is probably Elisabeth of Romania (Wikipedia link here) who died in the south of France in 1956. She was probably in exile in France because of the Bolshevic Revolution in Russia and some of it’s surrounding countries, Romania being one of them. She probably named the dog Drac out of a mix of rebellion against the communists and nostalgia towards her country and it’s history and heroes. Vlad Tepes is a hero in Romania, not a hated man. Decades later, Romania was one of the first countries, along with Hungary, to have violent rebellions before the fall of the U.S.S.R.